Got an Old Furnace? Here's When it Might Need Replacement | Sierra Pacific Home & Comfort, Inc. Does it feel like you’re constantly turning up the heat just to stay warm this season? It’s not just you—a furnace near the end of its life will fail to distribute air through the home properly. Along with a general dissatisfaction for your furnace, you may also notice uneven heating through rooms across the home. An aging furnace will simply fail to perform as efficiently as it once did. That means increased running time, increased energy expenditure, and increased wear-and-tear on the parts. When you combine all of those factors, you can anticipate a much higher heating bill. It’s generally observed that the last two years of the furnace’s life is when it demands the most amount of repairs. 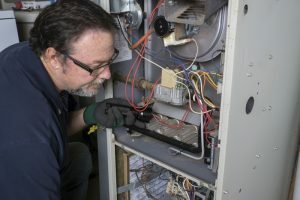 If you suddenly find that you’re having to call in for your furnace more than once during the same year, that could be a sign that your furnace is nearing replacement. You can always bring up your concerns to your HVAC technician so they can take a closer look. Noises: Screeching, grinding, clunking, vibrating … A furnace can make many odd noises, and they’re almost always due to a repair issue. Call it in and get an opinion instead of hoping it will pass. Airflow issues: Feeling cold or room-temperature air from your furnace—or no airflow at all—may indicate a serious repair issue. Not starting: Several components are responsible for starting the furnace, such as the pilot light or hot surface igniter, gas burners, thermopiles and thermocouples. Even one of them falling into disrepair can mean a furnace that refuses to start. When any of the above issues happen while your furnace is young, we always encourage you to get a maintenance check. A general tune-up will help fix inefficiencies, as well as allowing us to prevent any repair problems. But if your furnace is too old, you’ll find that the usual tune-up just isn’t enough anymore.